3. 2 Input Encoding Targeting Two-Level Logic . . . . . . . . 27 3. 2. 1 One-Hot Coding and Multiple-Valued Minimization 28 3. 2. 2 Input Constraints and Face Embedding 30 3. 3 Satisfying Encoding Constraints . . . . . . . 32 3. 3. 1 Definitions . . . . . . . . . . . . . . . 32 3. 3. 2 Column-Based Constraint Satisfaction 33 3. 3. 3 Row-Based Constraint Satisfaction . . 37 3. 3. 4 Constraint Satisfaction Using Dichotomies . 38 3. 3. 5 Simulated Annealing for Constraint Satisfaction 41 3. 4 Input Encoding Targeting Multilevel Logic. . 43 3. 4. 1 Kernels and Kernel Intersections . . . 44 3. 4. 2 Kernels and Multiple-Valued Variables 46 3. 4. 3 Multiple-Valued Factorization. . . . . 48 3. 4. 4 Size Estimation in Algebraic Decomposition . 53 3. 4. 5 The Encoding Step . 54 3. 5 Conclusion . . . . . . . . . 55 4 Encoding of Symbolic Outputs 57 4. 1 Heuristic Output Encoding Targeting Two-Level Logic. 59 4. 1. 1 Dominance Relations. . . . . . . . . . . . . . . . 59 4. 1. 2 Output Encoding by the Derivation of Dominance Relations . . . . . . . . . . . . . . . . . . . . . 60 . . 4. 1. 3 Heuristics to Minimize the Number of Encoding Bits . . . . . . . . . . . . 64 4. 1. 4 Disjunctive Relationships . . . . . . . . . . . 65 4. 1. 5 Summary . . . . . . . . . . . . . . . . . . 66 . . 4. 2 Exact Output Encoding Targeting Two-Level Logic. 66 4. 2. 1 Generation of Generalized Prime Implicants . 68 4. 2. 2 Selecting a Minimum Encodeable Cover . . . 68 4. 2. 3 Dominance and Disjunctive Relationships to S- isfy Constraints . . . . . . . . . . . 70 4. 2. 4 Constructing the Optimized Cover 73 4. 2. 5 Correctness of the Procedure . . 73 4. 2. 6 Multiple Symbolic Outputs . 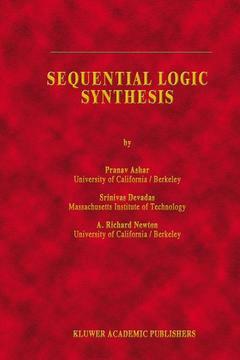 . .
Acknowledgments.- 1 Introduction.- 1.1 Computer-Aided VLSI Design.- 1.2 The Synthesis Pipeline.- 1.3 Sequential Logic Synthesis.- 1.4 Early Work in Sequential Logic Synthesis.- 1.5 Recent Developments.- 1.5.1 State Encoding.- 1.5.2 Finite State Machine Decomposition.- 1.5.3 Sequential Don’t Cares.- 1.5.4 Sequential Resynthesis at the Logic Level.- 1.6 Organization of the Book.- 2 Basic Definitions and Concepts.- 2.1 Two-Valued Logic.- 2.2 Multiple-Valued Logic.- 2.3 Multilevel Logic.- 2.4 Multiple-Valued Input, Multilevel Logic.- 2.5 Finite Automata.- 3 Encoding of Symbolic Inputs.- 3.1 Introduction.- 3.2 Input Encoding Targeting Two-Level Logic.- 3.2.1 One-Hot Coding and Multiple-Valued Minimization.- 3.2.2 Input Constraints and Face Embedding.- 3.3 Satisfying Encoding Constraints.- 3.3.1 Definitions.- 3.3.2 Column-Based Constraint Satisfaction.- 3.3.3 Row-Based Constraint Satisfaction.- 3.3.4 Constraint Satisfaction Using Dichotomies.- 3.3.5 Simulated Annealing for Constraint Satisfaction.- 3.4 Input Encoding Targeting Multilevel Logic.- 3.4.1 Kernels and Kernel Intersections.- 3.4.2 Kernels and Multiple-Valued Variables.- 3.4.3 Multiple-Valued Factorization.- 3.4.4 Size Estimation in Algebraic Decomposition.- 3.4.5 The Encoding Step.- 3.5 Conclusion.- 4 Encoding of Symbolic Outputs.- 4.1 Heuristic Output Encoding Targeting Two-Level Logic.- 4.1.1 Dominance Relations.- 4.1.2 Output Encoding by the Derivation of Dominance Relations.- 4.1.3 Heuristics to Minimize the Number of Encoding Bits.- 4.1.4 Disjunctive Relationships.- 4.1.5 Summary.- 4.2 Exact Output Encoding Targeting Two-Level Logic.- 4.2.1 Generation of Generalized Prime Implicants.- 4.2.2 Selecting a Minimum Encodeable Cover.- 4.2.3 Dominance and Disjunctive Relationships to Sat-isfy Constraints.- 4.2.4 Constructing the Optimized Cover.- 4.2.5 Correctness of the Procedure.- 4.2.6 Multiple Symbolic Outputs.- 4.2.7 The Issue of the All Zeros Code.- 4.2.8 Reduced Prime Immplicant Table Generation.- 4.2.9 Covering with Encodeability Constraints.- 4.2.10 Experimental Results Using the Exact Algorithm.- 4.2.11 Computationally Efficient Heuristic Minimization.- 4.3 Symbolic Output Don’t Cares.- 4.4 Output Encoding for Multilevel Logic.- 4.5Conclusion.- 5 State Encoding.- 5.1 Heuristic State Encoding Targeting Two-Level Logic.- 5.1.1 Approximating State Encoding as Input Encoding.- 5.1.2 Constructing Input and Dominance Relations.- 5.1.3 Heuristics to Minimize the Number of Encoding Bits.- 5.1.4 Alternate Heuristic State Encoding Strategies.- 5.2 Exact State Encoding for Two-Level Logic.- 5.2.1 Generation of Generalized Prime Implicants.- 5.2.2 Selecting a Minimum Encodeable Cover.- 5.2.3 Constructing an Optimized Cover.- 5.2.4 Reduced Prime Implicant Table Generation.- 5.2.5 The Covering Step.- 5.2.6 Heuristics to Minimize the Number of Encoding Bits.- 5.2.7 Encoding Via Boolean Satisfiability.- 5.3 Symbolic Next State Don’t Cares.- 5.4 State Encoding for Multilevel Logic.- 5.4.1 Introduction.- 5.4.2 Modeling Common Cube Extraction.- 5.4.3 A Fanout-Oriented Algorithm.- 5.4.4 A Fanin-Oriented Algorithm.- 5.4.5 The Embedding Algorithm.- 5.4.6 Improvements to Estimation Strategies.- 5.5 Conclusion.- 6 Finite State Machine Decomposition.- 6.1 Introduction.- 6.2 Definitions for Decomposition.- 6.3 Preserved Covers and Partitions.- 6.4 General Decomposition Using Factors.- 6.4.1 Introduction.- 6.4.2 An Example Factorization.- 6.4.3 Defining An Exact Factor.- 6.4.4 Exact Factorization.- 6.4.5 Identifying Good Factors.- 6.4.6 Limitations of the Factoring Approach.- 6.5 Exact Decomposition Procedure for a Two-Way General Topology.- 6.5.1 The Cost Function.- 6.5.2 Formulation of Optimum Decomposition.- 6.5.3 Relationship to Partition Algebra.- 6.5.4 Relationship to Factorization.- 6.5.5 Generalized Prime Implicant Generation.- 6.5.6 Encodeability of a GPI Cover.- 6.5.7 Correctness of the Exact Algorithm.- 6.5.8 Checking for Output Constraint Violations.- 6.5.9 Checking for Input Constraint Violations.- 6.5.10 Relative Complexity of Encodeability Checking.- 6.5.11 The Covering Step in Exact Decomposition.- 6.6 Targeting Arbitrary Topologies.- 6.6.1 Cascade Decompositions.- 6.6.2 Parallel Decompositions.- 6.6.3 Arbitrary Decompositions.- 6.6.4 Exactness of the Decomposition Procedure.- 6.7 Heuristic General Decomposition.- 6.7.1 Overview.- 6.7.2 Minimization of Covers and Removal of Constraint Violations.- 6.7.3 Symbolic-expand.- 6.7.4 Symbolic-reduce.- 6.8 Relationship to State Assignment.- 6.9 Experimental Results.- 6.10 Conclusion.- 7 Sequential Don’t Cares.- 7.1 Introduction.- 7.2 State Minimization.- 7.2.1 Generating the Implication Table.- 7.2.2 Completely-Specified Machines.- 7.2.3 Incompletely-Specified Machines.- 7.2.4 Dealing with Exponentially-Sized Input Alphabets.- 7.3 Input Don’t Care Sequences.- 7.3.1 Input Don’t Care Vectors.- 7.3.2 Input Don’t Care Sequences to Minimize States.- 7.3.3 Exploiting Input Don’t Care Sequences.- 7.3.4 Early Work on Input Don’t Care Sequences.- 7.4 Output Don’t Cares to Minimize States.- 7.4.1 Exploiting Output Don’t Cares.- 7.5 Single Machine Optimization at the Logic Level.- 7.5.1 Introduction.- 7.5.2 Invalid State and Unspecified Edge Don’t Cares.- 7.5.3 Equivalent State Don’t Cares.- 7.5.4 Boolean Relations Due To Equivalent States.- 7.5.5 Minimization With Don’t Cares and Boolean Re-lations.- 7.6 Interconnected Machine Optimization at the Logic Level.- 7.6.1 Unconditional Compatibility.- 7.6.2 Conditional Compatibility.- 7.6.3 Invalid States and Edges.- 7.6.4 Searching for Unreachability and Compatibility.- 7.7 Conclusion.- 8 Conclusions and Directions for Future Work.- 8.1 Alternate Representations.- 8.2 Optimization at the Logic Level.- 8.3 Don’t Cares and Testability.- 8.4 Exploiting Register-Transfer Level Information.- 8.5 Sequential Logic Synthesis Systems.